According to Vedic science, the Bhagavad Gita and Samkhya Philosophy, the entire universe consists of two main categories: Purush (reality) and Prakriti (Maya/illusion). The philosophy states that, things which can be changed or are not infinite happen to be a part of Maya. Purush, on the other hand, is all about reality, the unchangeable element or the soul. Discriminating the between real and unreal is the hardest task and also yoga’s ultimate aim. A yogi who can see only the reality beyond the illusion can be considered a true yogi – a person who has achieved enlightenment. The Vedic philosophy also states that every creation (Prakriti) consists of 3 gunas or virtues. The virtues or qualities are present in every object to varying degrees. However, one virtue is always dominant than the other two. The 3 gunas are known as Tamas, Rajas and Sattva. The Tamas guna is usually associated with feeling like heaviness, inertia and lethargy. Rajas guna corresponds to feelings like excitement, activity, energy, mental agitation as well as restlessness. Sattva guna represents feelings such as lightness, joyfulness, and expansiveness. 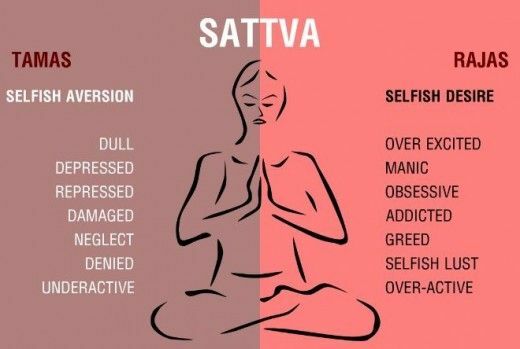 The Yoga Sutras of Patanjali emphasizes on the enhancement of the quality of Sattva in a person so as to transform his life in the most natural manner. Strict adherence to Sattva results in the person carrying the same into his life. Let’s try and understand the gunas in detail and how it is possible to stimulate them so as to live a life of harmony and balance. Sattva represents harmony, knowledge and purity. It is associated with feelings of goodness, contentment, nobility, satisfaction and joy. Sattvic quality happens to be forgiving and pure. Yogis aspire to increase the Sattva quality in them so as to attain liberation or ‘Samadhi’. However, in order to increase the Sattva quality it is necessary to reduce Rajas and Tamas from the mind as well as from the body. Sattvic quality can be increased by different ways – eating Sattvic foods like vegetables, whole grains, legumes and fresh fruits. Also, it is important to maintain a yogic lifestyle and be surrounded by like-minded positive people. Doing things that bring happiness and joy is also another way of increasing Sattvic elements in the body and mind. Rajas Guna is a representation of motion, energy, action and passion. A mind that is Rajasic in nature will always seek variety and new sensations. At times, it will like certain objects, places and persons, but it will quickly change and the mind will get disgusted with everything that was pleasing to it in a short span of time. It will long for new people, new places and new objects. People who are influenced by this Guna will find defects in others and also remember the bad acts instead of the good acts of a person. For those who wish to reduce the Rajas guna from their mind and body need to cut down on stimulants like coffee as well as spicy and fried foods. Tamas Guna is associated with darkness, laziness and impurity. Ignorance happens to be the root cause of this Guna and disallows a person to see the reality. People who have higher influence of the Tamas Guna in their life attract misery. Drug addiction, drunkenness, bad food habits and bad lifestyle are all part of Tamasic activities. In order to reduce Tamas Guna, it is necessary to avoid processed foods as well as abstain from oversleeping, overeating, etc. Since the idea is to increase the influence of the Sattva Guna in the body and the mind, performing the following asanas in the given sequence can help achieve the same. • Sun Salutations – Practicing sun salutations results in warming up of the all the muscles and joints in the body. This helps in the ejection of anxiety or agitation. • Standing Poses – After the sun salutations, perform standing poses to increase vigor, confidence and strength. It helps in the promotion of attention of mind. • Prone and Supine Yoga Poses – Supine and prone yoga poses help you to settle down after you are done with the Sun salutations poses and standing poses. The mind becomes calm and relaxed when you practice supine and prone yoga poses. • Seated Yoga Poses along with Pranayama – The practice of seated poses helps to open up the hips and stretch the lower back. Seated poses can be considered as preparatory poses for pranayama. With the practice of seated yoga asanas, you learn the art of focusing inward. The practice of pranayama, on the other hand, clears your nadis and calms down your mind. • Dhyana or Meditation – Dhyana or meditation is the ultimate step to increase the dominance of Sattva quality. With meditation, the mind becomes focused and you are absorbed in a natural way throughout the entire duration of the practice. Sattva quality is enhanced in this phase. Give the above-mentioned sequence a try and see how it affects your body and mind in a profound manner. Embrace Sattva Guna in your life and spread the light on others as well.